but the complex interaction of cultural practices, ideologies, and social codes of recognition. Necipoglu focuses on the imperial iconograpy of palatial forms that lack monumentality, axiality, and rational-geometric planning principles to decipher codes of grandeur that are no longer obvious to the modern observer. She reconstructs the architectural and ceremonial impact of the palace through a step-by-step tour of its buildings, demonstrating how the palace was experienced as a processional sequence of separate courts and seemingly disjointed architectural elements that were nevertheless integrated into a coherent whole by passage through time and space. 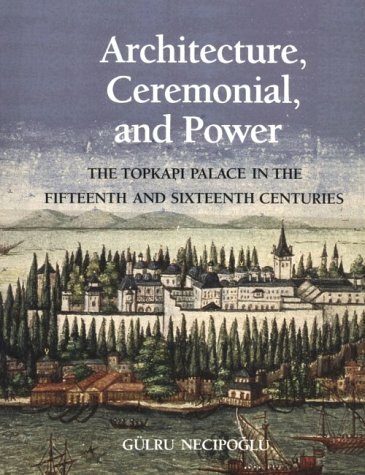 Far more than an analysis of the architectural program of the palace, Architecture, Ceremonial, and Powerraises questions and provides answers to fundamental concerns about the ideology of absolute sovereignty, the interplay between architecture and ritual, and the changing perceptions of a building through the centuries, a building that drew upon a wide range of Palatine traditions, mythical, Islamic, Turco-Mongol, Romano-Byzantine, and Italian Renaissance. Guuml;lru Necipoglu is John L. Loeb Associate Professor of the Humanities in the Fine Arts Department at Harvard University.